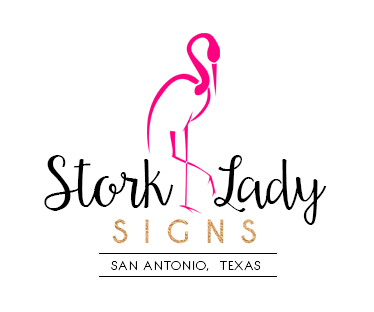 How much does a Stork Lady “new baby” announcement yard sign rental cost? How long is the rental period? The charge for renting the sign of your choice is $75.00. * The rental period is one week. We will leave the bundle, star or cloud at the front door when we return to pick up the sign. A “new baby” lawn sign announcement costs about the same as sending flowers, but it’s more fun and the impact lasts much longer! How much are the sibling / message stars? The first star is $20. Any additional stars are $15 each. How much does a birthday yard sign rental cost? How long is the rental period? The charge for renting the birthday sign of your choice is $75.00. * The rental period is for 3-7 days, your choice. When we return to pick up the sign following the rental period we will leave the message plaque at the front door for the honoree to keep. PLEASE NOTE: The toppers on the cupcakes are part of the sign and are not kept by the birthday recipient. How much are the birthday message stars? What color vinyl do you use on the baby bundle, stars, clouds and birthday message plaques? Our default color is black because black is the only color that can easily be read from a distance (the street). However, we are happy to use your color preference. Be sure to let us know at the time you order. If you don’t request a different color we will use black. Most of the time we use black for the messages on our birthday plaques because it’s the only color that can be read from a distance (the street). However, if there is room we add color to the plaques in the form of dots or other decorative features. If you prefer a different color for the message plaque please let us know at the time you place your order. Where will you place the sign in the yard? We choose the best location possible for visibility, as well as for the best photo ops. That said, sometimes there are issues such as utility boxes, a solid base of limestone, automatic lawn sprinkler systems, tree roots or landscaping that will dictate placement. In those situations, we will still use our best judgment as to location and it always works out just fine. If there is a specific location, you’d like for the sign to be please let us know when you order and we will do our very best to place it there. We cannot guarantee exact placement of the sign to your specifications if you are not home when we deliver the sign or you have not obviously marked the location in the yard with a tangible marker. But we will get very close. PLEASE NOTE: We cannot place a sign in front of public utility boxes, water mains or any other structure owned by the city or state. We cannot impede access to these areas or we could be fined by the city or county. What is your area of service? Do you deliver signs for display on the property of commercial business locations? We serve the greater San Antonio area, including Fair Oaks Ranch, Boerne, Universal City, Windcrest, Converse, Live Oak, Selma, and Elmendorf. We are unable to deliver signs to Cibolo and New Braunfels, TX. We don’t deliver our signs for display at commercial business locations, nor apartment complexes or condominiums. Management does not allow for lawn signs because all property is community property. We do deliver to town homes as long as there is a small patch of lawn for use in order to set up the storks or birthday signs. The lawn must be for the specific use of the homeowner or lessee. We deliver signs to all residential lawns. It depends on the delivery location. We are located in the Sea World area. The price of the rental includes the first 15 miles we travel. If the delivery location is 16-25 miles away there is a $10 charge. If it’s 26-30 miles away there is a $15 or $20 delivery charge. Please note: Due to heavy traffic and the time involved in travel, the following locations incur a $20 delivery charge: Anything beyond Leon Springs on I-10, including Fair Oaks Ranch and Boerne. There is also a $20 delivery charge to Universal City, Windcrest, Converse, Live Oak and Selma. We are unable to deliver signs to Cibolo and New Braunfels, TX. We normally set up a separate sign for each baby. The first sign is priced at the regular rate. Each subsequent sign is $55.00. At the end of the rental period the new parents keep each personalized bundle, star or cloud. If you’d like to have a single sign for multiple births the carriage makes the best choice. It’s easy to announce twins or triplets with the carriage because of the way it’s made. It’s the only sign that can hold more than one personalized keepsake. If a grandparents’ sign is ordered at the same time as the sign for the new parents the rental price is discounted to $55.00**. If the grandparents’ would prefer a personalized bundle, star or cloud to keep at the end of the rental period the charge is $20.00. When do you deliver your signs? We deliver and pick up our signs seven days per week. We deliver once per day. Monday through Saturday deliveries begin at 9:00 a.m. We are finished no later than noon. On Sunday we deliver later in the morning. If you have a special request for delivery at a certain time please call and we will do our best to arrange it. We don’t take reservations in advance, except for showers or gender reveal parties. We have lots of stork signs and we will have one available when the time comes. If you’d like to have the stork in the yard before the new parents arrive home with the baby, we must have all the necessary info and payment no later than 6:00 p.m. the evening before they are to be discharged. An earlier notice is appreciated, but 6:00 p.m. is the firm cut-off for next day deliveries. We take most orders by phone at 210-601-7351. If you prefer you may contact us via email at hello@storklady.com. We’re just like the florist. We accept Visa, Master Card, Discover and American Express over the phone in payment of the rental. You may mail a personal check, cashier’s check, or money order if you are calling well ahead and time permits. Orders must be paid in advance. The security guard at a gated community refuses to allow us entry Please note: We stay very busy and we can’t wait at a gate for more than 10 minutes while the guard attempts to contact the homeowner to grant access. It is important that you make arrangements with the guard to give us access prior to the moment of delivery. **Delivery charges may apply if the grandparents’ address is more than 15 miles from our location.